This year has been absolutely jam packed full of trips already. It's been incredible exploring new places with new people, and I'm already itching for my next adventure. It's time to get the case back out for another trip! I'm heading to Menorca next week for my first time, to explore the beautiful island which is brimmed with beautiful beaches and some of the clearest waters in Europe. When I'm packing for a short trip, it's essential for me to pack some key pieces. I love to try something new with my wardrobe on a regular basis, whether this be experimenting with bold colours or unique prints, I'm keen to explore new looks! This is where Accessorize fits in perfectly with my holiday wardrobe. The theme of their new campaign is all about being 'In the moment' - that's exactly what motto suits my life the past year. I think it's super important to enjoy the now, and not focus so much on the past, or the future. This motto ties in perfectly with my constant travel schedule, as well as my attitude to trying new things! I absolutely love experimenting with new styles for my wardrobe. Accessorize have some stunning pieces in for this SS17, that are made to make a statement! I selected my favourites to pack in my hand luggage. I kept my choices minimal, but all pieces are essential for different looks. From statement chokers to wash bags, I know that each piece will be used in my day to day! Ensuring I'm able to fully enjoy my vacation, it's essential that I organize what I'm packing a little bit before my trip - I love knowing exactly what I'll be packing, and where it all is in my case. Here's some heads up below on some of the key pieces (aside from clothing) I like to include packing for my trips. I love nothing more than being organised with my smalls and delicates whilst packing for a trip. I think it's important to keep your jewellery separated and well storaged whilst travelling, there's nothing worse than detangling your necklaces from your rings, or even worse, loosing some pieces along route! Accessorize have made it easy for us with some of the multi bags that are now being stocked online. My favourites are the 3-in-1 floral zip pouches, two of the bags are transparent finished with a gorgeous floral design. I love being able to see where my items are in the pouches before diving in! They have a smaller purple bag too- this one is perfect for more delicate pieces, or for smaller jewels such as earrings, body jewellery and rings! These metallic beauties just HAD to come along with me - the hi-shine material is perfect for teaming with multiple outfits. I think these are fab for dressing up and dressing down! They're super comfortable too. For a short trip, you really don't need many swimsuits! I have only planned to take 2 away with me, one of them being this gorgeous floral swimsuit. The bold print is extremely eye catching, with a shape that is incredibly flattering to many body shapes. I absolutely love the low cut cleavage on this too, but it's not too revealing which makes me feel more comfortable! 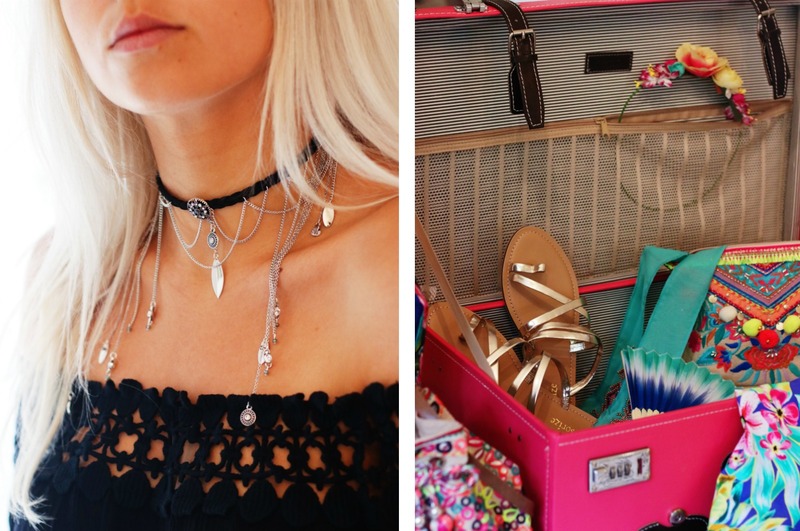 Yes, chokers are 100% an essential for me, not necessarily just for holidays, but EVERY DAY. I LOVE a fabulous choker. Accessorize have so many incredible chokers too, I've chosen a few of my favourites to take away with me, (including this delicate black one below!) - For me, chokers absolutely make an outfit, I feel I don't need to wear any other jewellery pieces either! A fabulous pair of sunglasses. That can be worn with multiple outfits! I loved this pair from Accessorize, since the frame is super on trend right now, and suits my face! I also love that the polarized lens is blue, so it goes with the rest of my pieces I'm packing! A little somethin' somethin' to keep you cool. I've never realized how handy these actually are until my recent trip - this is going to help you out a bunch when you're stuffed up on public transport, or maybe you're at the beach on a windless day! I'm in LOVE with this gradient blue one, it does also come in pink too! & for £5, you can't go wrong. It's small, so it's more than easy to keep in your hand bag! P.S how adorable is the blue tassel?! 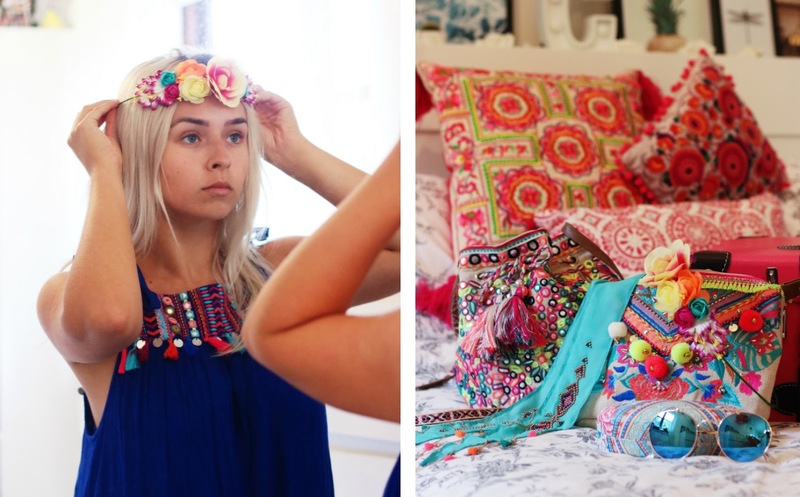 I hope you all enjoyed reading about my what I love to pack for a trip away! 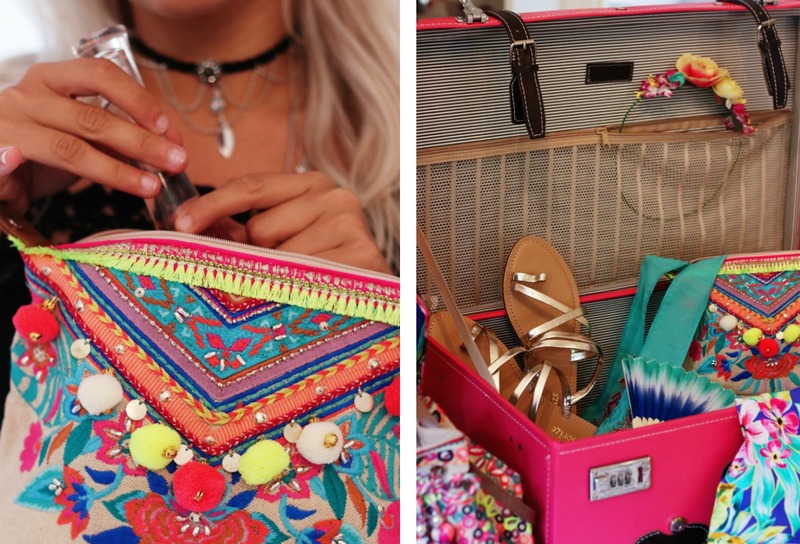 Thank you Accessorize for getting me excited for my trip when it comes to packing unique and fresh pieces. duffel bag. scarf choker. washbag. sunglasses. statement choker. 3-in-1 makeup bags. oh, that is so... colorfull. I love it.